Scroll to the bottom for the special Lat & Lo discount code. I had to answer a simple question this week, but my husband was surprised by my answer. The question was: Where are you anchored? I immediately thought of where I met my husband. It’s a small town nestled sweetly in the center of California. We don’t live there anymore, but that city means a great deal to me. I graduated from college there. I lived on my own there. I had a lot of firsts there. We moved south of our alma mater over 10 years ago. Since then, I’ve had three babies here. I’ve started and ended careers here. We bought our first home here. Our home is here, not there. And yet, my college town still has my heart. It feels like home every time I drive through. It’s my town. Before I became a Mom. Do you have a place like that too? A place that feels like home no matter how many years pass? It’s amazing how one place can steal your heart like that. Maybe it’s the town that you grew up in. Maybe it’s that gorgeous place where the trees change colors in the fall. Maybe it’s that place where you’re surrounded by the beach everywhere you look. Or, maybe it’s where there’s no Target yet (yes, a place like that exists… *shudder*). Wherever it is and whatever makes it special to you, it’s probably that place where it just “feels” like home whenever you’re there. The email was from a company named, Lat & Lo (short for Latitude and Longitude). 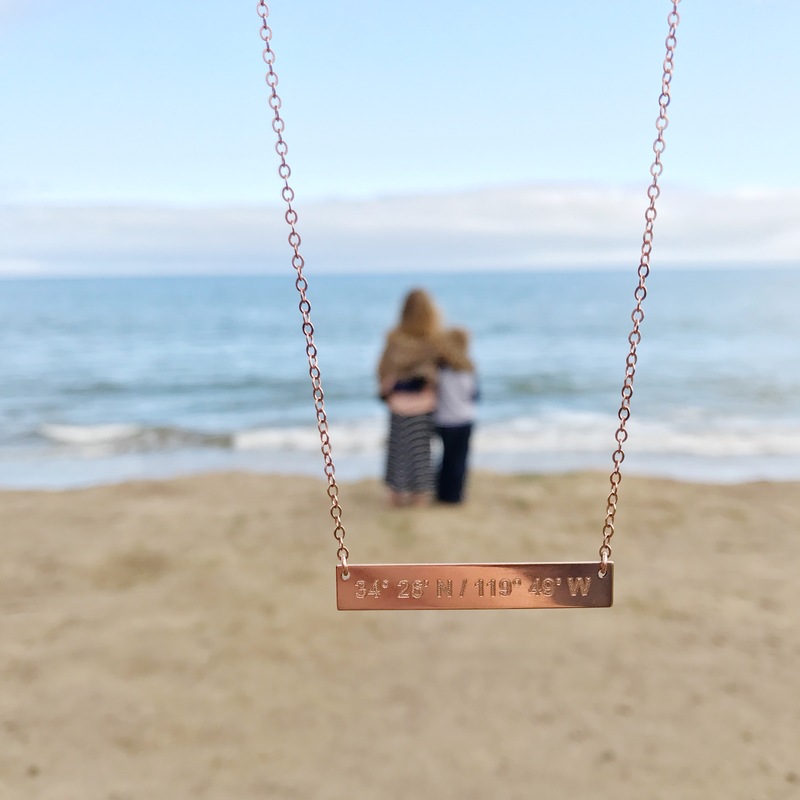 They make necklaces with the latitude and longitude of any place you’d like. The place where you feel anchored. I ended up getting the latitude and longitude of our current city (see the pic above). And, the inscription on the back? It says, “Lil.Math.Andy”. – nicknames for my three kids. What place would you choose if you had to choose just one? Sometimes, it’s easier to reminisce about the past, instead of being right where you are. It makes me think of the quote: “bloom where you are planted.” And, the other saying, “be where you are.” Even if you’re not settled exactly where you’d like to be, I hope that you’re open. Open to the possibility that this place has something unique to offer, even if it doesn’t feel like home yet. Because the truth is that we are here, not there. So, let’s make the best of it. I promise to try, if you do– deal? PS. Here’s the CODE for your discount on your own Lat & Lo necklace!